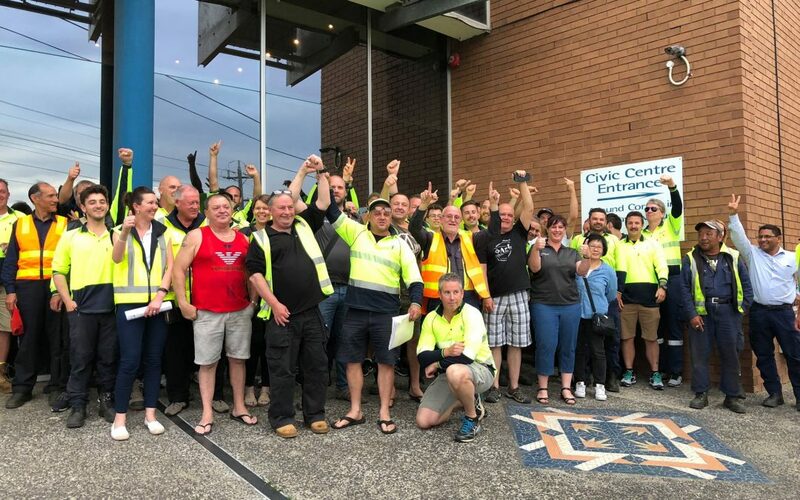 In a triumph of common sense over bad decision making, ASU members at the Moonee Valley City Council Depot were relieved when Councillors unanimously voted to end negotiations to relocate their Depot outside the MVCC municipality. Council officers attempted to bulldoze the opinions and expert knowledge of workers through a short and poorly executed plan to lease a site which needed over $2.5million just to get ready to use. However the plans came to an abrupt halt when not a single Councillor was convinced about the suitability of the site, or the work done in search of an alternative to the depot’s current location. Over 60 ASU Members and Officials attended the Council meeting on 13 November to watch this critical decision about the future of their workplace. The chambers erupted into loud applause when the right decision was made! ASU delegates and members had been advocating for an alternative proposal for several weeks, and telling Councillors and Moonee Valley City Council CEO that the proposal needed to be blocked. The ASU, on behalf of all our fantastic members and delegates at MVCC, congratulate those Councillors who blocked this outrageous proposal, and hope that Council officers now see the importance of respecting the views of workers and the Union.